A high performance double metal stud party wall system from CSR Bradford is helping keep the peace at The Claremont, a 20-storey luxury apartment building in Melbourne. Additionally, Bradford bio-soluble glasswool and Bradford glasswool partition batts were also used in the application. 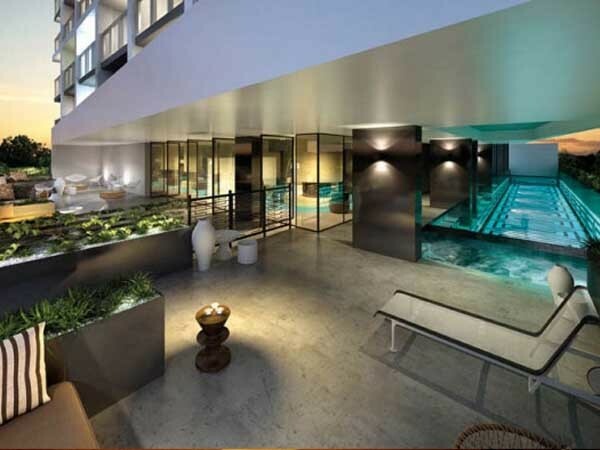 Designed by Bird De La Coeur Architects and built by Icon Construction in 2011, The Claremont is a sleekly designed residential development in South Yarra with a treetop level swimming pool, summer lounge and winter garden. Located just 400m from the Yarra River and South Yarra’s busy shopping and café strip, the apartment project was awarded the Urban Development Institute of Australia (UDIA) High Density Award in 2012. Featuring a total of 166 apartments in single and two-bedroom configurations as well as two larger combined apartments, a ground floor lobby and a communal winter lounge and summer deck on level 5, the development maintains a high level of design integrity throughout, from the sculptural stone of the entry and the highly graphic tiling to the pool. Bradford’s high performance double metal stud party wall system 216 achieves an Rw/Rw+Ctr of 55/50 to ensure minimal noise transmission between the residential units. Bradford FBS-1 Bio-Soluble glasswool insulation manufactured in Australia for the Australian climate was used as the wall cavity infill. Additionally, one layer of 165mm and one layer of 50mm Bradford glasswool 11kg/m³ partition batts were also used in the application.